Ultralight. Ultra Sharp. Replacement blade knife. Custom laser cut and precision machined stainless steel handle. This is the perfect knife for backpack hunting, fishing, or hiking adventures. 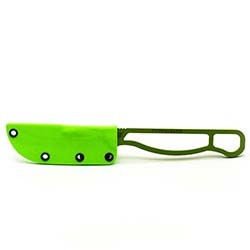 This custom replaceable blade handle is the first of its kind. Its simplistic design is lightweight, durable, and easy to clean making it an essential item on everyone's pack list. Made in the USA. Includes sheath, 10 Size 60 replacement blades. From kevin massaro of littleton, Colorado on 1/12/2018 . Solid, light, and well built. The scabbard fits tightly. I have not had the chance to use it in the field, but am comfortable today saying that it's pretty much foolproof. I like this knife a lot. And with the orange scabbard, my chances of losing it are probably slim. From Sandys18 of Grand Rapids , Minnesota on 1/11/2018 . Love this product. It works great and I never have to worry about the blade folding over on me. Blades are much easier to change out with Tyto. From Cody of SPRING CREEK, Nevada on 11/8/2017 . 10/20/2017 – Does the replacement blades offer a gut hook blade or small bone saw? They accept any of the Havolon Piranta blades which includes the saw and gut hook blades. 10/20/2017 – Does this take Havalon replacement blades? Response From Rokslide: Lee, They do take the standard size Havalon blades.